All of us at Chelsea Clock share a genuine passion for and appreciation of beautiful timepieces. Of course, Chelseas top our collective list of favorites. But we – and many friends of Chelsea – have interests in the designs and craftsmanship of all kinds of timepieces. And we are always happy to hear from fellow collectors about the clocks to which they are drawn and why they collect them. Carolyn Crimmins Kurth is one such friend. Carolyn recently wrote to us about the Ship’s Bell clock and barometer that sailed with her father, Capt. Arthur W. Crimmins, for many years. We’re pleased to publish her story here, and invite others to share their stories with us as part of this ongoing series. Drop us a line by visiting the Contact Us page on our website or by emailing newsletter@chelseaclock.com! I am happy to write that I am now the proud caretaker of a Chelsea Ship’s Bell clock and barometer which belonged to my father, Capt. Arthur Crimmins, for more than 40 years. The two pieces not only hold such wonderful memories for me, but have quite a special history, which I’m pleased to share here. My father, Capt. Art, enjoyed a long and exciting career as the owner and captain of several charter sailing yachts, sailing the Bahamas and other parts of the Caribbean. 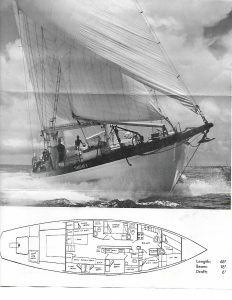 He chartered his first sailboat from Miami across the Gulf Stream in the 1940s until 1959 with the Traveler, a 40′ ketch, which he built in the 1940s in Man-O-War Cay in the Bahamas. When I was an infant, my “bed” was a milk crate stuck in the hold of the boat while it was being completed on the Miami river. 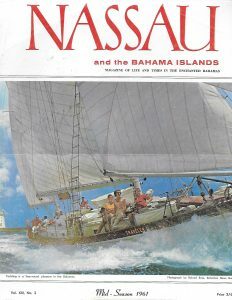 In 1959, my father sold the Traveler and purchased Traveler II, a 68′ ketch, which he then began chartering throughout the Bahamas, with my step-mother, Peggy, as his “first mate.” That same year, he outfitted his new craft with a Chelsea Ship’s Bell Clock and Barometer, which continued to sail with him aboard every new boat thereafter. For nearly fifteen years, my father introduced countless charter guests – some famous and others infamous – to the joys and adventures of sailing aboard the Traveler II. This luxury yacht, designed by John G. Alden, could accommodate up to six guests in private staterooms and, in 1960s advertising, boasted such amenities as air conditioning, electric refrigeration, an 11-cu. ft. deep freeze, air foam mattresses, and a hi-fi stereo system. 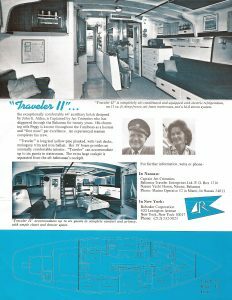 By the early 1970s, my father was eager for a change – feeling somewhat overwhelmed by the maintenance demands of Traveler II – and decided it was time to “downsize.” That’s when he and Peggy moved to Hong Kong to oversee the construction of a 62′ ketch, aptly named the Traveller III. Completed 18 months later, they returned to the U.S. with this new vessel and chartered it throughout the U.S. Virgin Islands. This boat was a dream-come-true for my father. In addition to its 16-foot beam and six-foot draft with centerboard up, the Traveller III offered two well-appointed staterooms, crew’s quarters, two bathrooms with showers, and a spacious main air-conditioned salon. My father had an amazing talent for sailing and true passion for life at sea. He recounted wonderful stories about the people he met and the adventures they shared together aboard his prized charters. My father eventually sold his last yacht, the Interlude, also built in Hong Kong, in 1989 and retired inland to Beaufort, SC. Of course, his Chelseas retired there with him, proudly displayed alongside other “trophies” from his glorious sailing days. I’m so pleased to have these special keepsakes (which are in excellent working condition, I might add) in my home now. They not only remind me, daily, of my dear father and the wonderful, adventurous life he led, but inspire me to continue to explore and enjoy all of life’s possibilities! I have a Naval 24hr clock,Serial Number 31635E. It way my Grandfather’s and way mounted in his kitchen for are long are I can remember. Have home desire to sell it but would like a little help with it’s are and history so I can get a proper appraisal for insurance reasons. Anything help would need great. Thank You. Thank you for your inquiry. We would need to know the serial number appearing on the inside mechanism in order to search our manufacturing log for the manufacture date and any other details. You would need to remove the clock from the case to locate the serial number. Thank you.